Heat oven to 300°F. Line large cookie sheet with parchment paper. Draw 10-inch circle on paper; flip paper over. In large bowl, beat egg whites and cream of tartar with electric mixer on medium speed until foamy. Gradually add sugar, 1 tablespoon at a time, beating on high speed until stiff glossy peaks form and sugar is almost dissolved (about 6 minutes). Beat in vanilla. Spoon meringue onto cookie sheet. Shape into 10-inch round, using circle as a guide and building up sides with back of spoon. Place in 300°F oven. Immediately reduce oven temperature to 250°F. Bake 55 to 60 minutes or until firm and dry to the touch. (Inside of meringue will still be soft.) Cool on cooling rack 1 hour or until completely cooled. Carefully remove meringue from paper. Just before serving, in chilled medium bowl, beat whipping cream and cream of coconut with electric mixer on high speed until stiff peaks form. Place cooled meringue on serving plate. 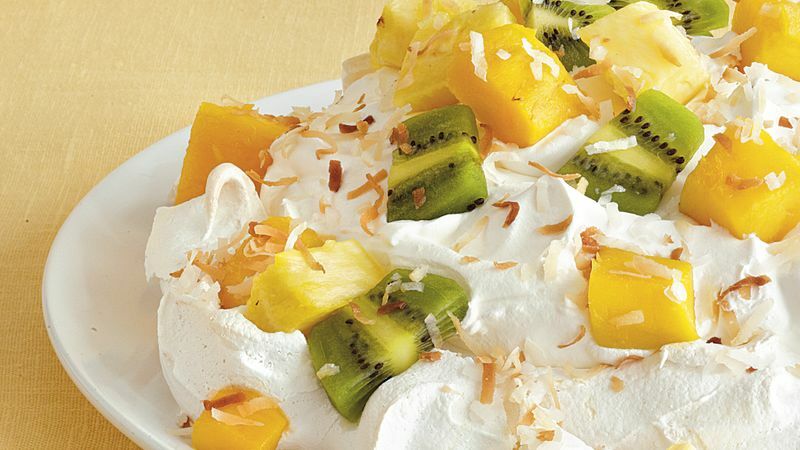 Fill center with whipped cream; arrange fruit over whipped cream. Top with coconut. Store in refrigerator up to 2 hours. To toast the coconut, heat oven to 350°F. Spread coconut in ungreased shallow pan. Bake uncovered 5 to 7 minutes, stirring occasionally, until golden brown.